Poulomi is a sixth year Ph.D. candidate in comparative politics. Her research interests include political economy of development, identity politics, public service delivery and local governance with a regional focus on South Asia. 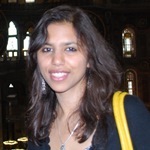 Her dissertation project explores the determinants of sub-national variation in development in India. Towards this end, she is interested in how different political-economic regimes came to be constructed in post-independent India. Poulomi has a masters degree in international development from MIT and undergraduate degree in urban planning from the School of Planning and Architecture in New Delhi. Before coming to Brown, she worked on issues related to decentralization and local governance at the World Bank in Washington DC.